The Navahos, Zah Tso and her sister, taught me this game also, calling it Ma-i-at-sani-il-watli. An example (22718) in the Philadelphia Free Museum of Science and Art, from St. Michael's Mission, Arizona, is labelled Mai-i-atlsa-yill-aghueli = Two Coyotes Running Apart. First, Second and Third movements are the same as the First, Second and Third movements of "Many Stars." 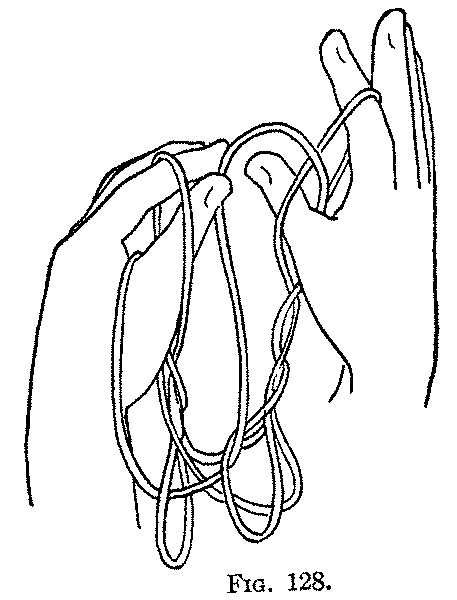 Fourth: Pass each thumb from below into the index loop, and bend it over the far index string; turning the palm away from you, pass the thumb away from you under all the strings, and catch the far little ringer string on the far side with the back of the thumb (Fig. 123, Left hand), and return the thumb to its position (Fig. 123, Right hand). Release the loops from the little fingers. 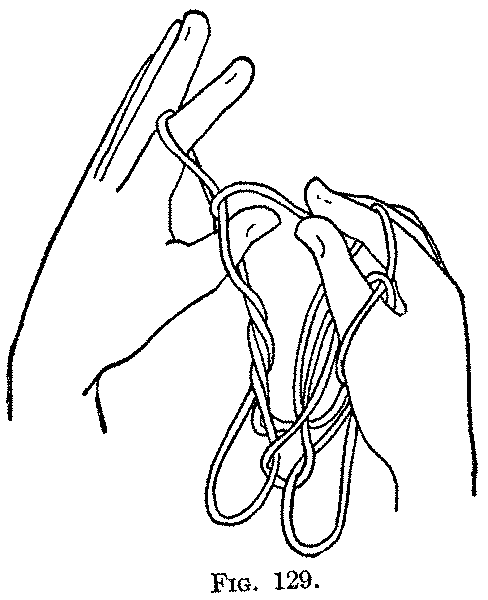 Fifth: Put the tips of the right thumb and index together and put the tips of the left thumb and index together; now, turning the palms slightly away from you, pass these fingers over the thumb and index loops and away from you under and past the two strings of the middle finger loop. Then drawing the thumb and index (still held together) toward you, take up on their tips the far middle finger string and draw it toward you under the near middle finger string. Let the twisted loop slip off each middle finger and withdraw the thumb, leaving the loop well up toward the tip of the index (Fig. 124). 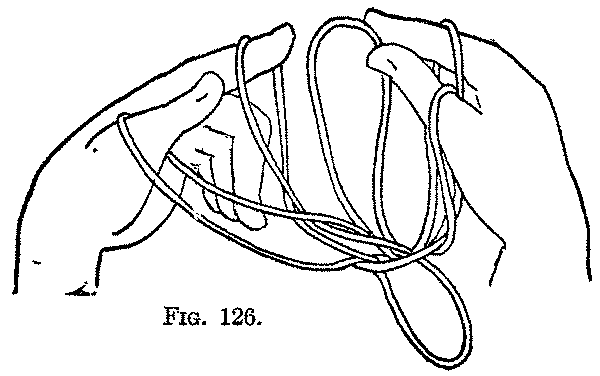 Sixth: Keeping all the loops carefully on the left hand, with the left thumb and index lift the right lower index loop over the right upper index loop, and entirely off the finger (Fig. 125) and let it drop on the palmar side, being careful not to take off also the upper loop. 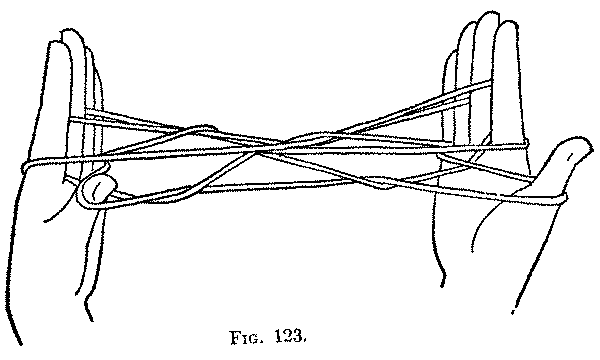 In the same manner with the right thumb and index lift the left lower index loop over the left upper index loop, and entirely off the index (Fig. 126). Do not pull the strings tight after this movement. Seventh: Put the right thumb from below into the right index loop (Fig. 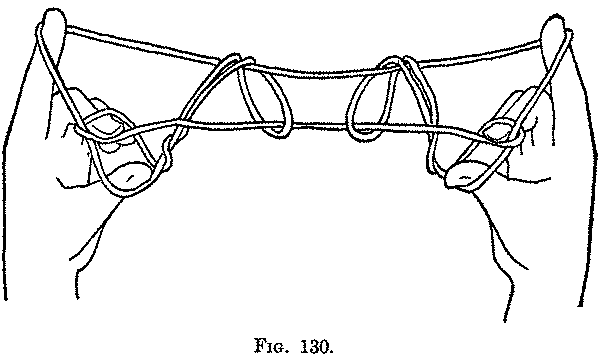 127, Right hand), and with the left thumb and index (Fig. 128) or with the teeth, lift the right near thumb string up over the tip of the thumb, without disturbing the string which passes around both thumb and index. In like manner put the left thumb from below into the left index loop (Fig. 127, Left hand), and with the right thumb and index (Fig. 129), or with the teeth, lift the left near thumb string over the tip of the left thumb. Do not pull the strings tight after this movement. 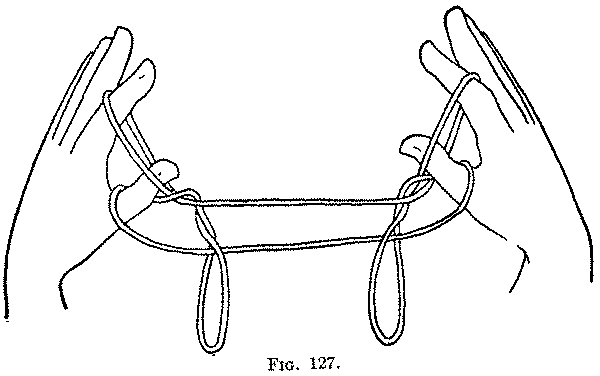 There are now two straight strings which cross the thumb loop and form a loop around the string passing from the back of the thumb to the back of the index. 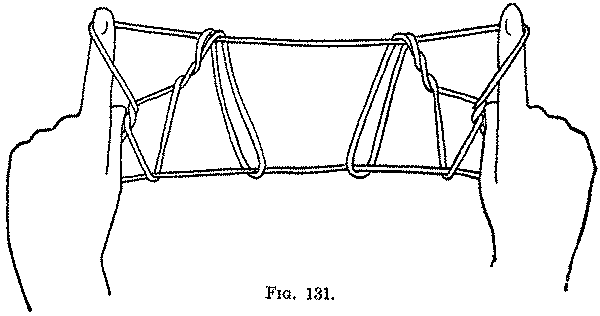 Eighth: Put each middle finger from below between these straight strings, so that the lower string is on the far side of it and the upper string on the near side of it (Fig. 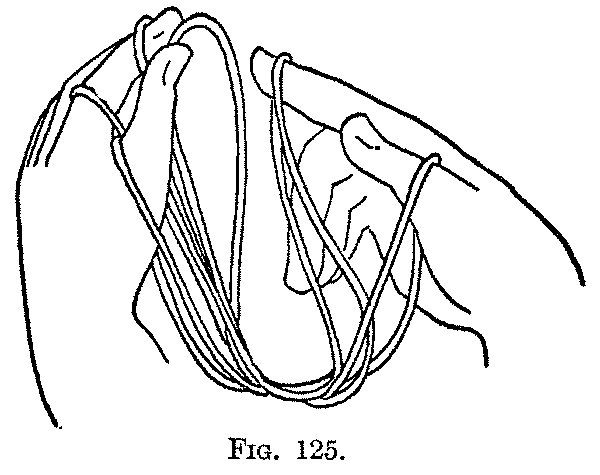 130); then bend the middle finger down toward you over the upper string and, holding it in the bend of the linger, draw it down and away from you through the thumb loop, and release the loops from the thumbs. 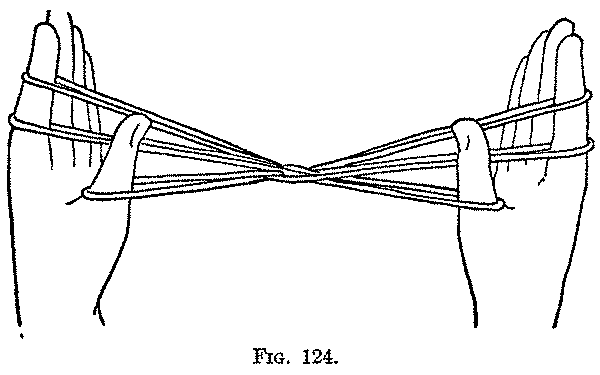 Closing each middle finger down on the palm, hold the index strings high on the finger tips and separate the hands (Fig. 131). If the strings be permitted to slip around the index fingers the "coyotes" will run away from each other. When we analyze this figure we see that it has the iirst four movements of the "Third Owl," the Fifth of "Many Stars" and the Sixth, Seventh and Eighth of the "Two-horned Star."